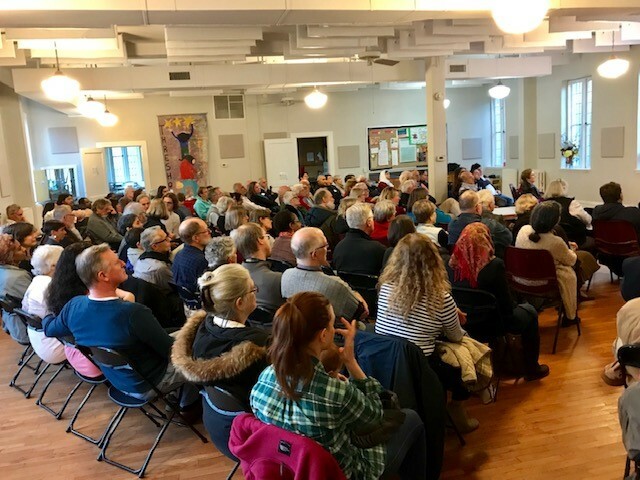 On November 16, 2018, Beth (our FOTONNA Tour Coordinator), Daoud and I returned home after an eight-day trip across southern and central Virginia, sharing the story of the Nassar family’s persistent stand in claiming their ancestral lands through a simple message of “refusing to be enemies/loving our neighbor” and doing so through a creative non-violent approach to the Israeli occupation. We traveled to small cities and communities, stopping to speak to university students, justice-and-peace groups and the faithful in various churches. As well as these scheduled events, there were many spontaneous moments, too, as you shall see. The first morning in Harrisonburg, Virginia (in a home built by the Mennonite owners as a replica of a country home in a traditional community with a mountain setting) provided a great start for our tour on November 8. The family opened their entire home to the three of us while they were off on a mission of their own elsewhere. We began with a gift of good food, coffee and the quiet of a small space overlooking the Massanuten range. After discussing our program for that day, we prayed for God’s grace on the tour with a biblical reading from Luke 5: 1-11. The passage was about Jesus’ ministry along the Galilee and his call to the fishermen who were cleaning their nets after having a fruitless experience the night before. He said that the opportunities for a harvest were not along the shoreline but in going to the “deeper waters” where there was more vulnerability but where they would also find deeper purpose and greater reward. It was a call to “risk” for them. We reflected upon these words, in particular, which reminded us that our call was to go to those deeper places in our ministry together where the still, small voice was. Perhaps it was the “deeper waters” calling us, which it often does; we are on a faith journey, after all. We found God’s spirit in places we didn’t anticipate. Not always is it true that success is to be found only in the largest venues. 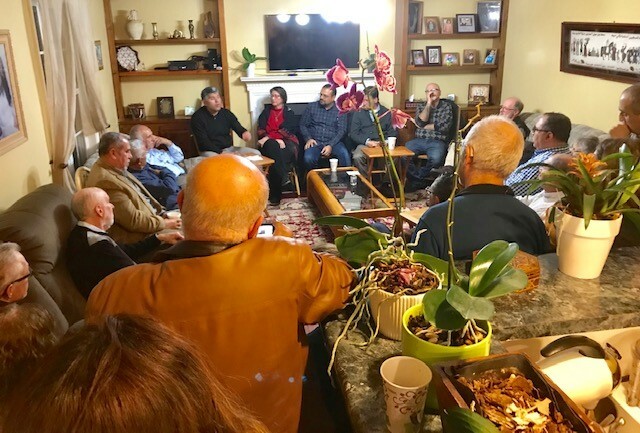 We also found it in the intimacy of our host family’s homes, in the gatherings around food with Palestinian Americans, and in the small groups of students who saw hope in the message of the Tent of Nations. Those were the moments of “deeper waters,” and the rewards for doing so were often in the power of their responses to “the message,” both on a personal level as well as within the context of the larger community. One such experience was at a potluck dinner in the home of Adeeb and Detisha Abed who invited forty of their friends to a feast. Prior to the meal and Daoud’s brief and informal story of his family’s struggle, others in the circle were asked to introduce themselves. What happened next was truly beautiful. After Daoud’s sharing of his family’s connection to the land, others, one by one, not only gave their name but went deeper by also sharing their own family’s story. What began as a mere formality became a series of touching moments within each introduction. An hour later, both women and men had shared their memories that identified their own precious connections to the land. For people of the diaspora, this is not the usual response in public. The pain of those memories is often too great and to remain connected to their lands too painful; therefore, they are stored away – shared sparingly. 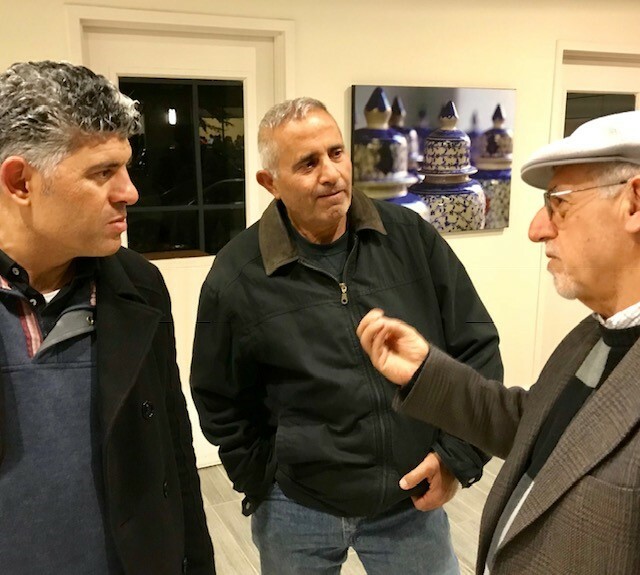 An example of such a risk was the story that Yousef told about his village in East Jerusalem, which he last saw in 1972, and is now divided by an Israeli settlement. He talked of memories of growing up as a boy and wandering through the streets of his village. His flow of tears, as he shared deeply with us, revealed a painful memory. After hearing Daoud’s story, and then telling his own, Yousef closed by declaring, “I want to return to my village and plant a tree!” Such a hopeful statement amongst the pain! There was not a dry eye in the circle of friends who had gathered together in that packed and grace-filled space. There were no words of bitterness, hatred or signs of victimization in the stories, and so it was throughout the evening. It all started with Daoud’s family story, which provided an example of how the power of a simple personal story that reveals something strong, deep and precious can be cathartic and help release the powerful and hope-filled voice within others. A second story came after an event in Charlottesville, Virginia, following a presentation at a Lutheran church there. As is often the case in our tours, we live with host families, and our experiences as guests can also peel away another level of the “onion skin,” like moments with stories within stories. We dove deeper into personal lives during our time with host families around a meal and a glass of wine. We found the richness of life beyond triviality, which often stalks our impersonal world, and instead we were able to create moments of beauty and untouched human experiences. In this particular case, the host was a woman who welcomed us into her home late at night after we had been traveling all day from the previous tour site and had given the presentation to another welcoming audience. She first thanked us for the message she heard that night at the church and expressed warmly how appreciative she was of that experience. At that, we offered to pray for her, and as she stepped forward, we embraced both the moment and each other, and she asked, “Can I pray for you?” After offering our own prayers for healing and our gratitude for our new friend and host, she gave thanks and shared her love for us. She told of her appreciation for the message we had shared earlier at the presentation and her deep understanding of what it means to lose your land and feel abandoned. She knew what it was like to be gathered up by a gift of love and show persistence in such moments of vulnerability. We all slept well that night in beds of comfort and warmth and awoke in the morning with all the makings of a morning feast, our host long gone to her work, but leaving behind another gift of a powerful story of her own. Finally, at nearly the last event of the tour, there were two students who showed up at the Wesley Foundation House on the William and Mary campus to an informal gathering with us. It was a cold, rainy evening and our host, a campus pastor, shared with us that he had no idea who might show up. 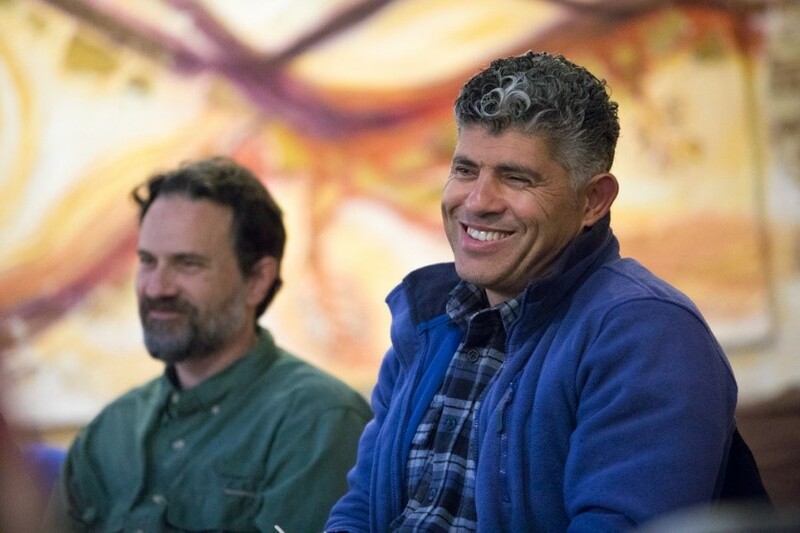 Daoud and I had learned from many experiences of years on tour together that it was not always that the Holy Spirit showed up where many were gathered; it also appeared in the smaller spaces of mystery and intrigue. So, we began the evening with munching on apples and an offering of “bubble-gum-flavored” grapes – which at least one of the two students (the one with beautiful red hair) proclaimed to be spectacular! I found them to be good, too. So, with that in mind, we proceeded with telling the story to our two visitors without all the bells and whistles of technology; it was the simple story which some of us had heard hundreds of times and never tired of listening to. One of the students seemed extremely interested in the story and, as a matter of fact, shared during the introductions that she had sat down an hour before and read everything online she could find related to the Tent of Nations’ experience and listed some pertinent questions she had. “Impressive,” I thought. Clearly, as the evening went on, she had done her homework, and she asked meaningful and deep questions that stirred the rest of us and gave us hope that all was not for naught. She showed up later, too, for the power-point presentation and continued her quest for understanding. I felt reassured that the new generation of seekers was our hope for the future, and it will be their stories that change the world. At least there will be one with red hair who will no doubt visit the land some day and come away with a new story to tell.